A study by LMU researchers shows that infants fed on fresh rather than UHT cow’s milk are less prone to infection. The authors recommend the use of alternative processing methods to preserve the protectants found in the natural product. A pan-European study, led by Professor Erika von Mutius, Professor of Pediatric Allergology at LMU and Head of the Asthma and Allergy Department at Dr. von Hauner’s Children’s Hospital, reports that fresh cow’s milk protects young children from respiratory infections, febrile illness and inflammation of the middle ear. Their results appear in the “Journal of Allergy and Clinical Immunology”. As untreated cow’s milk may itself contain pathogenic microorganisms and could pose a health risk, the researchers argue for the use of processing methods that preserve the protective agents present in raw milk. The findings are the latest to emerge from the long-term PASTURE study, which is exploring the role of dietary and environmental factors in the development of allergic illness. The study initially recruited 1000 pregnant women who were asked to document their children’s diet and state of health at weekly intervals during the first year of life. “Among children who were fed on fresh, unprocessed cow’s milk the incidence of head colds and other respiratory infections, febrile and middle-ear inflammation was found to be significantly lower than in the group whose milk ration consisted of the commercially processed ultra-pasteurized product,” says Dr. Georg Loss of Dr. von Hauner’s Hospital, first author of the new paper. Ingestion of farm milk reduced the risk of developing these conditions by up to 30%, and the effect was diminished if the milk was heated at home before consumption. Conventionally pasteurized milk retained the ability to reduce the risk of febrile illness, while exposure to the higher temperatures used in UHT processing eliminated the effect altogether. 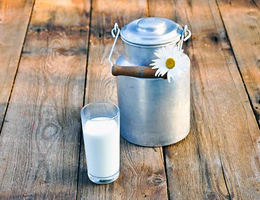 Importantly, the positive impact of raw milk could be clearly separated from the confounding effects of other elements of the children’s nutrition. “The effects of diverse milk treatments are presumably attributable to differentially heat-resistant components present in fresh milk. Compounds that are sensitive to heating seem to play a particularly important role in protection against respiratory-tract and ear infections,” says Loss. At the end of the first year of life, blood samples were obtained from the children enrolled in the study, and tested for biochemical indicators of immunological function. Infants fed on unprocessed milk were found to have lower levels of the C-reactive protein, which is a measure of inflammation status. “Other studies have shown that higher levels of inflammation are related to the subsequent emergence of chronic conditions such as asthma and obesity. Consumption of unprocessed milk may therefore reduce the risk of developing asthma,” Loss explains. Industrial processing of milk involves short-term heating of the raw product. Conventionally pasteurized milk has been exposed to temperatures of 72-75°C for 15 seconds, while ultra-pasteurized milk undergoes heating at around 135°C for a few seconds. The latter is also homogenized to disperse the milk fats, which prevents the formation of cream. “Consumption of unprocessed milk itself is not entirely without risk,” says Loss. Indeed, untreated milk may contain pathogenic bacteria that cause serious illnesses. Examples include the enterohemorrhagic Escherichia coli (EHEC) strains that are associated with severe diarrhea and kidney failure, and the microorganisms that cause listeriosis and tuberculosis. The researchers therefore suggest that alternative processing methods are needed for the industrial treatment of raw milk. “With novel, milder treatments one could produce milk that is free of pathogenic microorganisms but retains the protective agents found in fresh milk,” says Loss. In addition to fats and carbohydrates, cow’s milk contains proteins that can modulate the function of the immune system. “In many respects, the composition of cow’s milk is similar to that of human milk,” says Loss. It has long been known that breast-feeding protects infants from infection, although how milk actually affects the early immune function remains unclear. It is possible that some of the factors involved interact directly with viruses or that they promote the development of a healthy immune system by altering the composition of the gut microflora. Feeding young children with cow’s milk is also contentious because it can provoke allergic reactions. Among the children who participated in the PASTURE study only 2% had developed an allergy to milk or other food items prior to their first birthday. The 1000 pregnant women involved in the PASTURE study were recruited in rural areas of Bavaria, Finland, France, Switzerland and Austria, and approximately half of them live on farms. As well as monitoring maternal nutrition during pregnancy, the study will regularly assess their children’s health and developmental status during the first 10 years of life, in order to elucidate the role of environmental factors in the etiology of allergic disease. The study is being carried out by teams at LMU and the German Center for Lung Research, universities in Ulm, Marburg, Basel, Helsinki, Kuopio (Finland) and Besançon (France) and children’s hospitals in St. Gallen (Switzerland) and Schwarzach (Austria).